Heidi Reich, MD, a cardiac surgery resident, is shown with Panos Vardas, MD, vice president of Thoracic Surgery Resident Association. 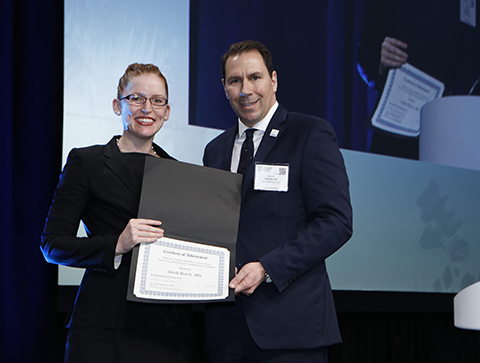 Heidi Reich, MD, a first-year cardiac surgery resident, has been awarded the 2017 TSRA/STS Traveling Fellowship in Cardiothoracic Surgery. The $5,000 fellowship funds a one-week observership with a host institution. Reich plans to use the fellowship to learn total arterial grafting and intraoperative assessment of graft patency. Teresa Kieser, MD, PhD, will host Reich at the University of Calgary beginning Feb. 26. The week will include observing at least four cases using total arterial grafting with intraoperative assessment of graft patency, daily teaching rounds, two multidisciplinary preoperative conferences and one afternoon of wetlab/skills simulation.